The World Ends With You is broken on iOS 8, and has been for a long time, to the point where Square Enix pulled it from the app store last week because it just doesn't work. Square tells Kotaku they're still working on a fix for the role-playing game—which was originally released on the DS and then remade in 2012 for iOS and Android—but right now, anyone who spent $18 on the app can't play it on devices with the latest operating system. Which is really too bad—it's a great game. It's the "Initializing..." screen that never ends. I took that from my iPad, where I played (and loved!) 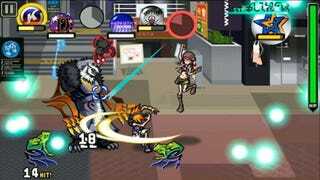 TWEWY a few years ago... it's sad to think that anyone who bought the game more recently might never actually be able to play it. In the meantime, if you bought the game recently, I guess you can try asking Apple for a refund. Or just wait.